What’s the latest on efforts to ban plastic bags? How many U.S. locales have instituted some kind of ban, and have these initiatives made a dent in the amount of plastic litter? Littered plastic is also a huge problem for the health of wildlife, as many animals ingest it thinking it is food and can have problems thereafter breathing and digesting. The nonprofit Worldwatch Institute reports that at least 267 species of marine wildlife are known to have suffered from entanglement or ingestion of marine debris, most of which is composed of plastic; tens of thousands of whales, birds, seals and turtles die every year from contact with oceanborne plastic bags. A recent European Commission study on the impact of litter on North Sea wildlife found that some 90 percent of the birds examined had plastic in their stomachs. 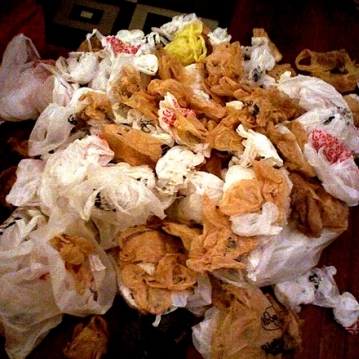 Another reason for banning plastic bags is their fossil fuel burden. Plastic is not only made from petroleum - producing it typically requires a lot of fossil-fuel-derived energy. The fact that Americans throw away some 100 billion plastic grocery bags each year means we are drilling for and importing millions of barrels worth of oil and natural gas for a convenient way to carry home a few groceries. CONTACTS: Worldwatch Institute, www. worldwatch.org; Earth Policy Institute, www.earth-policy.org. EarthTalk® is written and edited by Roddy Scheer and Doug Moss and is a registered trademark of E - The Environmental Magazine (www.emagazine.com). Send questions to: earthtalk@emagazine.com.